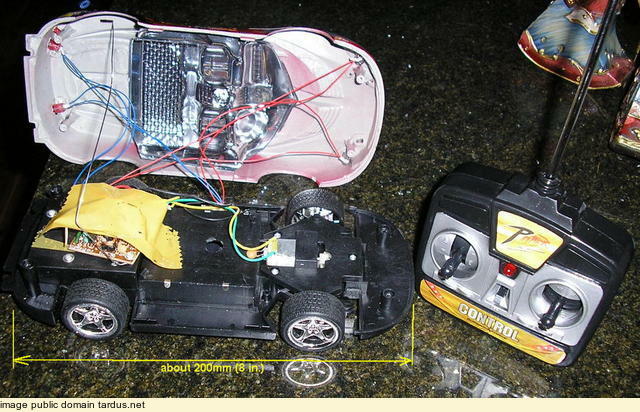 I picked up a cheap radio-control car toy with the idea of using it for a "real" model, say a scale fishing boat or tug. As I recall it cost about $12. As you can see it is about 200mm long. The radio gives full speed forward, stop, and reverse, and much the same for the steering motor. The latter is just geared to a rack that is the tie-rod for the front wheels, with spring centring. Put the lever left and the motor turns the wheels full left and then stalls. There is no proportional control, ie, a little left on the lever giving a little bit of left steering. The car needs 4 x AA cells, and the transmitter a single 9v rectangular battery (as typically used in smoke detectors). Better than I thought. Tested it today and it was still in full control at 75 metres (about 250 feet) and was hard to see at that distance. Speed is about 1.5 metres per second (a fast walking pace) with the back wheels turning at about 900 rpm. 900 rpm sounds like a good speed for the propellor of a low speed scale model boat (freighter, such as a Scottish puffer, a fishing boat such as a Scottish herring boat, or a tug-boat). Steering. I've a couple of junked conventional R/C servos. They have very low gearing and hence a very slow output shaft speed. Stripped of the feedback potentiometer and electronics one could be driven in either direction by the toy's receiver. For a slow speed model quick control is not needed. The rudder could be "jogged" into the right position, say for a wide turn, and then centring the control lever on the transmitter will just leave the rudder locked at that angle. I always have more ideas than time to develop them. If you like the idea and do something, please drop me a line. If I get to do something, I'll put it up on this web-site.